I looked out the window as our plane pulled into the gate and saw this fire engine red airplane on the tarmac. I love a group mind that decides to break the uniformity of the airplane fleet by painting one of the planes red. 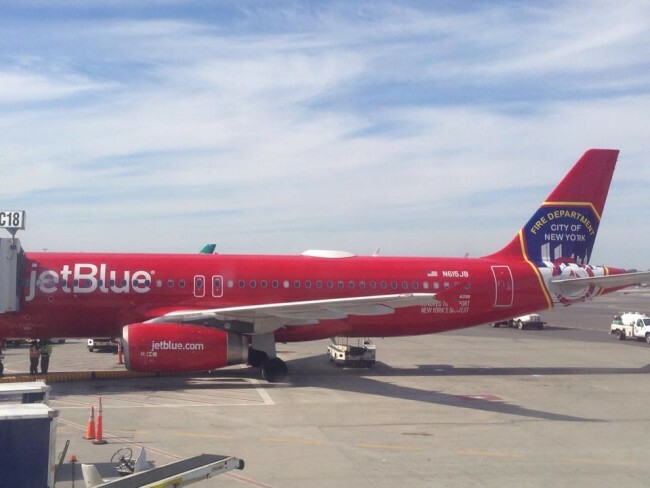 The painted JetBlue Airbus A320, called “Blue Bravest,” is meant to honor the New York City Fire Department. When I got home, I googled airplane art to take a look at the painted noses of some of the military aircraft during WWII. I’ve always found the lightness of the art (often pin-up girls and Disney themes) on these planes comforting. It comes down to this for me: there is never a time when we can’t be uplifted by the infusion of color and a playful spirit.